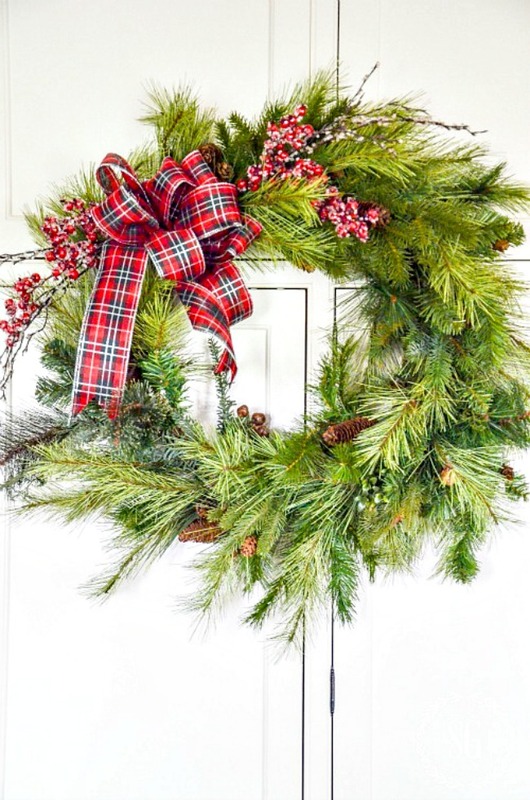 I bet you have an old faux wreath hanging around in your basement or attic or the back of a closet. Don’t throw it out! 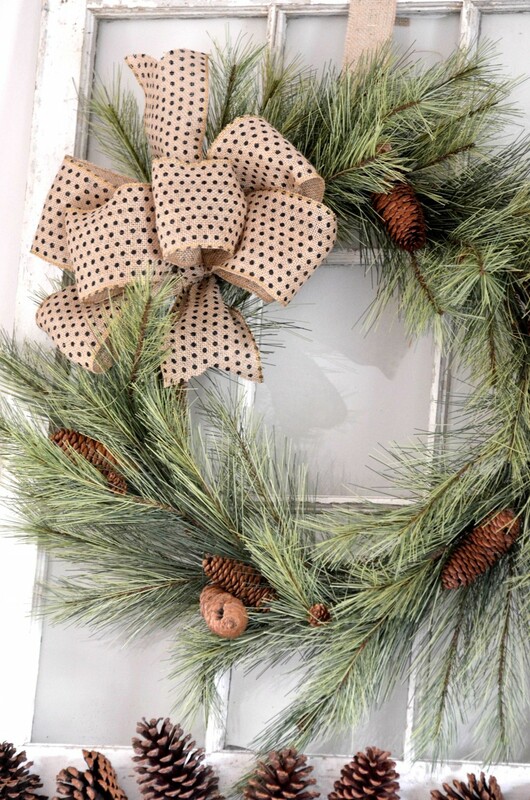 Instead update an old wreath by adding some more greens and embellishments and a big pretty bow! You won’t believe how nice it can look! 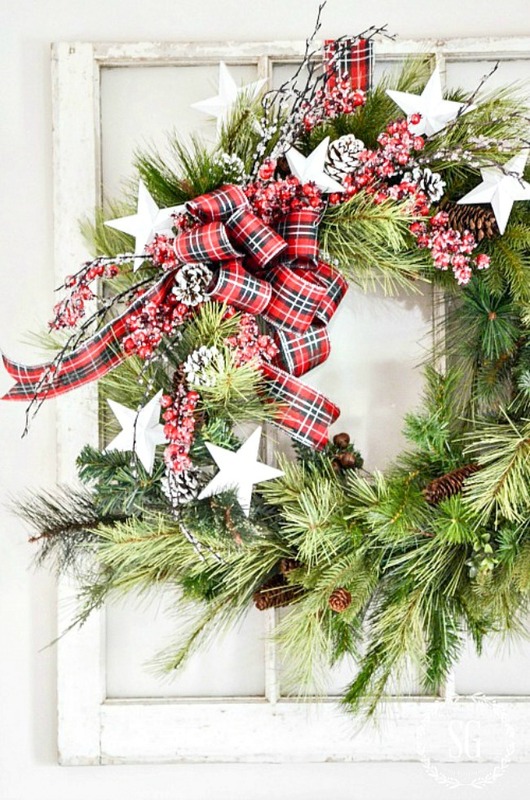 Today let’s save a wreath and make it Christmas ready! We share the best of the best of our archived posts here at HSS! So today I’m sharing one of my favorite holiday “rescue”. Here’s the nice thing about updating an old wreath beside not spending for a new one, you can make it to work with your current decor. Fabulous! Here is the wreath I used a few years ago. Not in bad shape, but not the style I’m looking for. 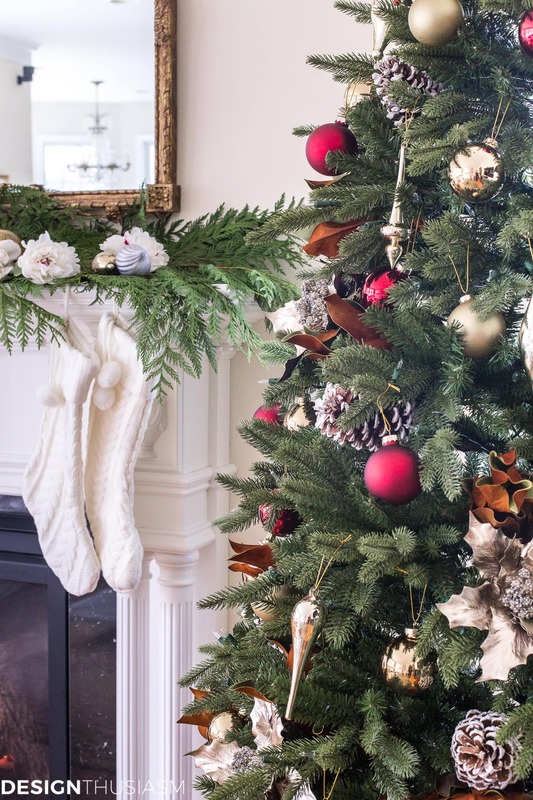 This year’s Christmas decor is more traditional and less farmhouse. So I took my pine wreath and started adding! I like to gather up my supplies. I always start with things I might use. I really don’t know until I start working with a wreath exactly what elements I’ll use. So I gather a “collection”. Because this wreath will be used indoors on the mantle I don’t have to glue the greens into the wreath. This will save both the greens and the wreath for future use. I intertwine the greens into the pine wreath. 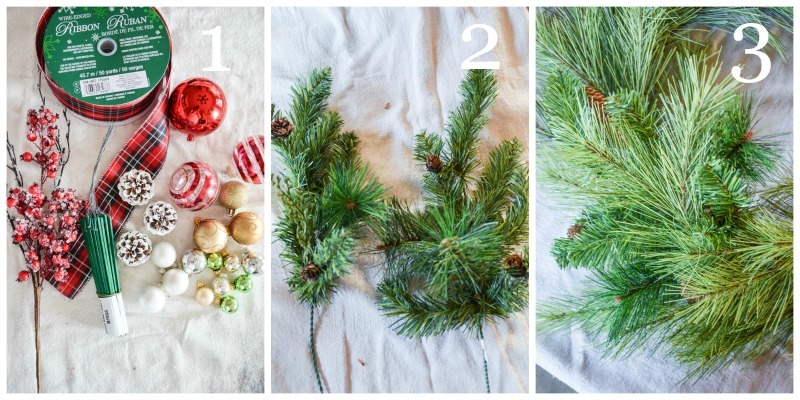 Keep adding different greens into your old wreath. Until you get the look you want. 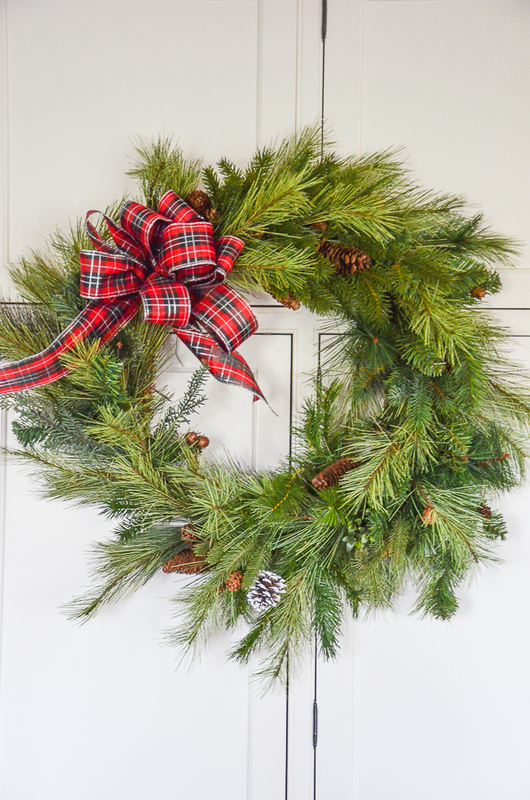 As you can see, the wreath is so much fuller and has many different kinds of green woven into the original pine. The next thing I did was make a loopy bow and attach it to the wreath with a thin wire. You might like to see my post on MAKING A CHRISTMAS BOW. I got this ribbon at Costco. Then I took long stems of frosted red berries and laced them through the greens into position. Before I put the rest of the decorations on the wreath I hung it on the mantle. Because I didn’t glue the embellishments in place I did not want to move it around much. If you are using an updated wreath where it might get touched or on a door make sure to put a dab of glue on the Christmas fru fru so it won’t drop. To hang the wreath, I took a length of ribbon and looped it through the metal rim in the back of the wreath and stapled the ribbon to itself securely! 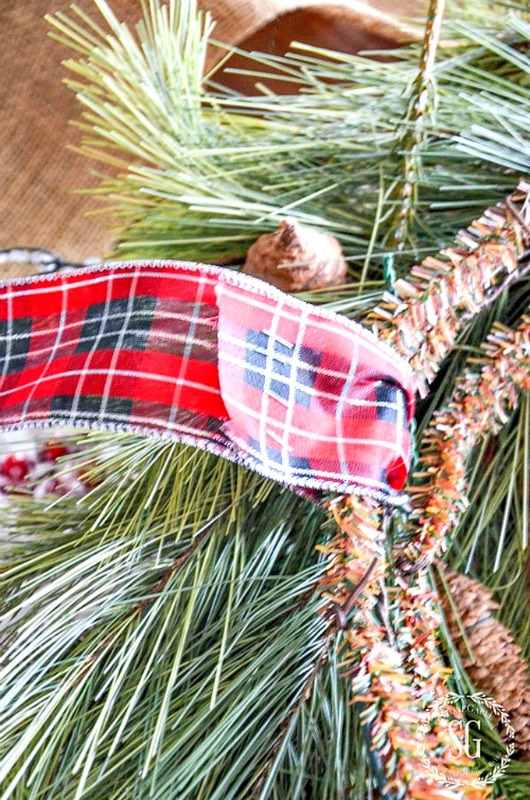 This made a nice ribbon to hang the wreath from. Once the wreath was hung I fluffed the bow and repositioned the berries and tucked snowy pinecone and stars into the wreath. This year’s decor has lots of stars! EASY PEASY! A new wreath from an old one! And my newly updated wreath has a whole new look! Because I didn’t glue anything together I’ll be able to take this wreath apart and use all the part again! 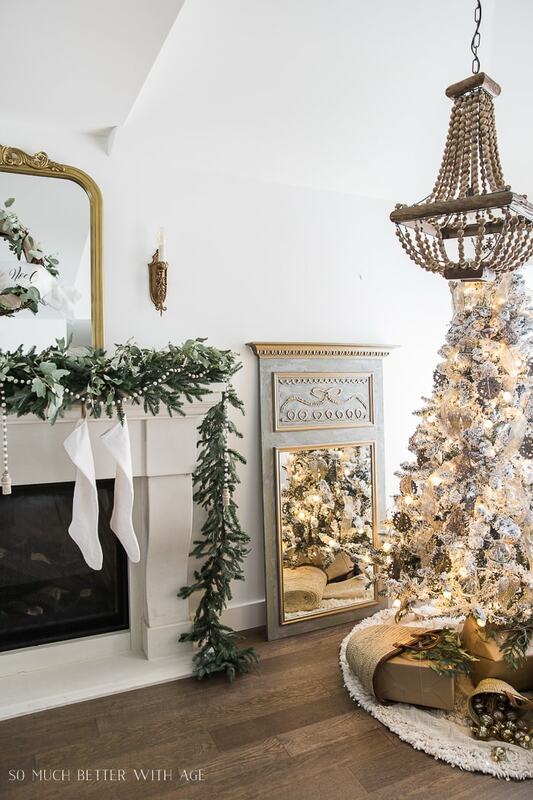 If you want to see the rest of the mantle click HERE! Now get busy! 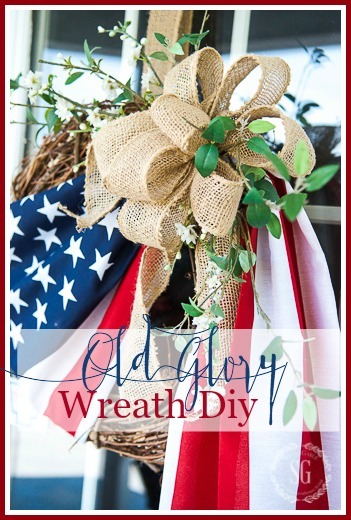 Get out an old wreath and some greens and see what you can come up with! I bet it will be spectacular! You can follow me on Pinterest and see what I’m pinning daily HERE! Yvonne, you are so organized! All your wreaths are great and you seem to have endless ideas! Oh goodness, Cecilia. I only look organized! Such delightful and festive wreaths, Yvonne! I have 3 old faux wreaths in a box downstairs, haven’t used them in years, but they’re in great condition. My husband was in my “stash room” recently and announced I had some “serious cleaning and pitching” to do. He mentioned the box of wreaths, in particular, I said, “Not yet, I might use them someday.” He reminded me I say that same thing every time… As it happens, my father-in-law took an old house down in the small rural town where he resides, he wanted the land, not the falling down house. He showed up at the end of the summer with 4 good size chippy white wood pane windows, I’m getting those old wreaths out now! 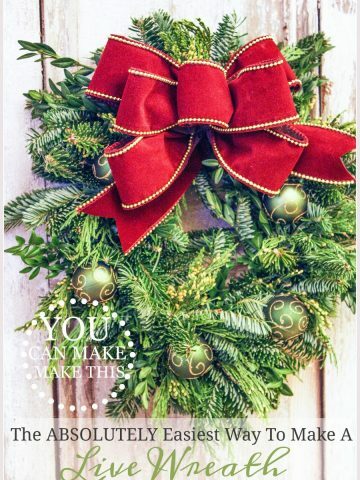 You will love making these wreaths! I make new ones over and over every year! I love, love, love, the stars I made clay and cut out tiny white stars, they are on a tree in the office. they add a lot ,so cute. I have a sheet music wreath that I tuck seasonal tissue paper in for the different holidays to change up the look, its fun to play! Please enter me into the drawing. Love, love, this money saving idea. Thanks for all the ideas you share with people who really need them (like me). God Bless you, Yvonne. I really enjoyed this post because of all the great tips! Thanks for sharing! Great article. 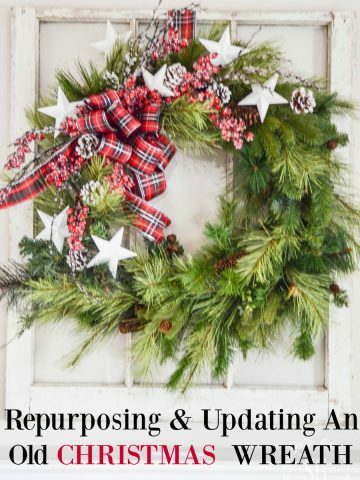 I kind of have the same problem, except that I have three old wreaths that I never really liked but have thought of scavaging bits and pieces off each and re-working the best wreath out of the three. Thanks for the ideas. 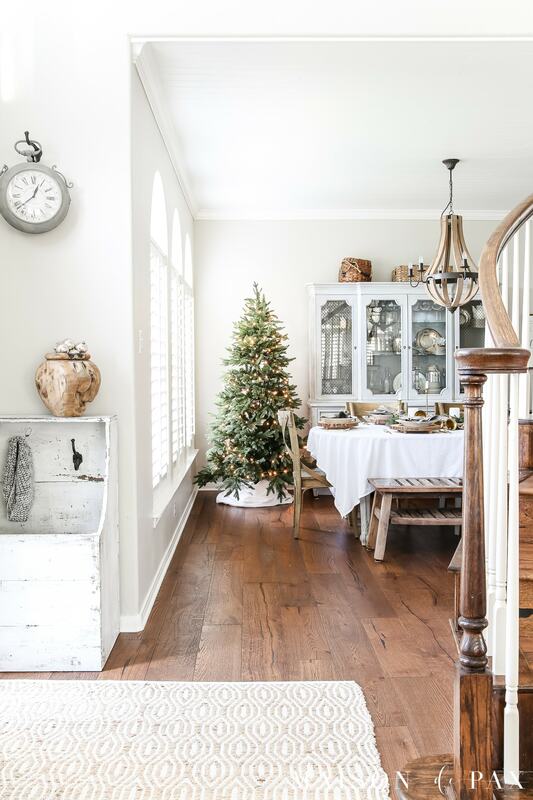 You have a BEAUTIFUL Christmas home. Have a Blessed holiday. Reusing, updating ideas are the best! Thank you and Merry Christmas. I made wreaths for all my windows when we purchased the home in 1989. About 11 yrs ago, my hubby was in Iraq during Christmas and I tossed the old wreaths and went with greenery on the sills with a red velvet bow in the center. Our trees & shrubbery have gotten taller & thicker, so I am now looking for something different to do in the front of the house. I have 11 floor to ceiling windows on the front. I now wish I had those old wreaths to refurbish. They were straw wreaths that I wrapped with green garland and inserted pick of holly had hung with red ribbons from the top of the window framing. Over the years of cold wet winter & the heat of summer attic storage, the wreaths had stretched to oval shapes that really bothered me. Time to start over again! Amazing wreath update. The stars were an especially nice addition! I love reading your blog!! May I ask where you purchase good quality faux wreaths and garland? Hi Tammy, to get really good faux greens I head straight to my local small business decor shops. They usually carry greens I love. They are quite pricey but I wait for sales and collect a little at a time. Over the years I’ve collected a nice bunch of greens that I reuse every year. Hope this helps. I so enjoy reading your blog Yvonne, have a joyous holiday season. Absolutely gorgeous wreath! Excellent idea to not glue on the embellishments so that you can use the wreath over and over. 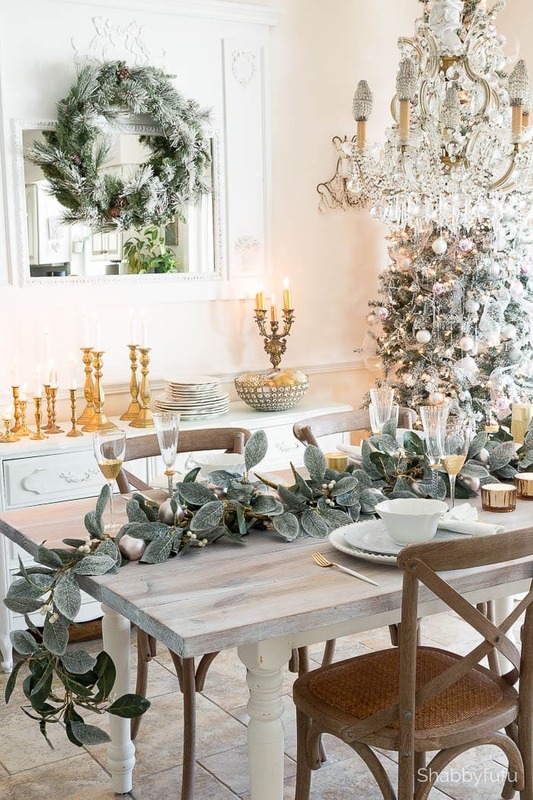 Love your style of decorating. Have a wonderful Christmas! Yvonne, your updated wreath is so special! Thank you for your always creative inspiration. 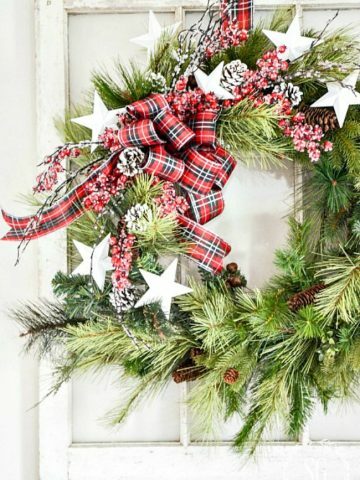 I have four wreaths in this same style hanging in my storage room. For years, I used them at my front windows, but grew a little tired of them and decided to change my window decor. The past two years, I’ve looked at them hanging there and had decided to donate them. After seeing your beautiful remake, I’m keeping two of them and bringing them back to life! Thank you! Thanks for the ideas! My wreath needed a redo! Thanks for the bow making tips too! I love remaking my wreaths each year. I rarely buy a new one. You cannot imagine how much your tips and step by step instructions are appreciated. 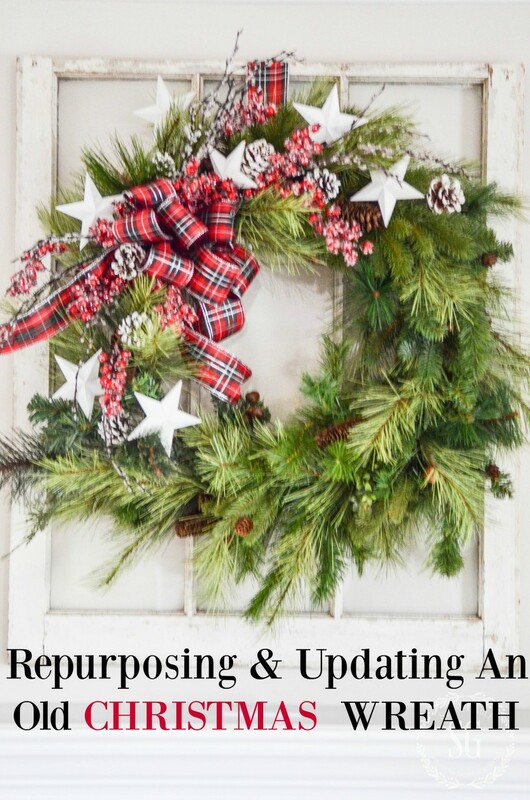 This wreath remake made me feel like I can consider myself more frugal and less miserly! I too am all about reusing and refurbishing decorating items. I figure anyone can go out and buy new things but it takes a different level of creativity to repurpose with what already exists. Thanks for the validation ? I love that wreath. Think I’ll try and duplicate it! That re-do wreath is awesome!! I love how you added other greens to it. It really made a difference! Yvonne you have the best ideas & you so willingly share them with directions ! You are the best! Thank you! Just the inspiration I needed! Thanks! Great job on the wreath! Looks wonderful! Love your new old wreath. So much fuller and joyful! Nice job ! I love reinventing what is around the house into something new. Me too, Doreen. I love when I have everything right here and don’t have to spend any $$! Another beautiful wreath ! I just “dolled up ” a garage sale wreath for my 103 year old step dad yesterday .Yours gave me another idea, so I’ll brave our first real snow here in Wisconsin and make his wreath even better. THANKS for all your inspiration. Can’t wait to see what’s on the menu for Christmas week-end . Give your step dad a hug for me! I love that you think of him too! Great daughter-in-law! Oh Yvonne! You just gave me a wonderful idea! Thank you! Back in the 80’s my wonderful Mother made me a huge wreath. 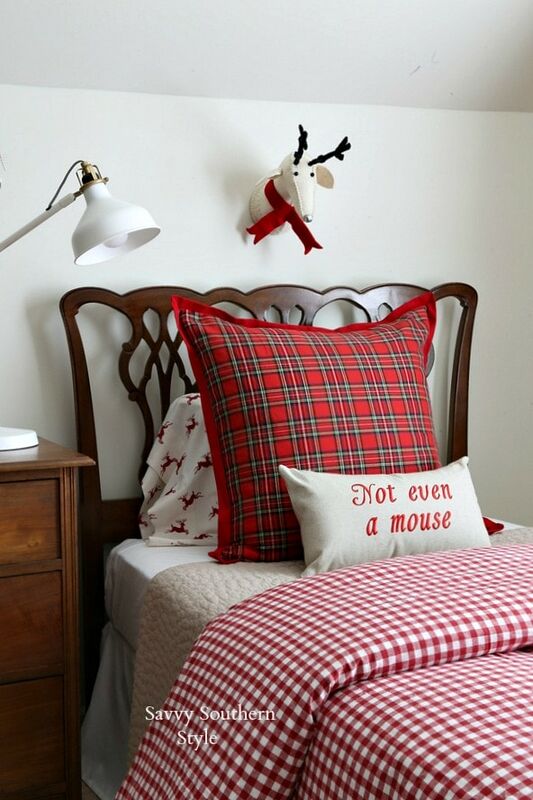 It’s mostly pine cones with red apple picks in it, and a large red velvet bow. Well, she passed away 25 years ago from cancer not long after my daughter was born. I still have that wreath and my husband hangs it every year. However, it does need updating! The red apples have cracked over the years. I think I would like to take those out, keep the pine cones but tuck in picks of greenery and update it a bit. I was afraid to touch it, but I think my Mom would really like for me to do that. You just gave me the inspiration I needed! great ideas…thanks for your inspired designing! Yvonne, you are The Wreath Wizard! Your wreath looks great. I have repurposed some of mine and I agree with you that you can make them look better. I also likeAnn’s Christmas tags. How cute. I love them too Phyl. 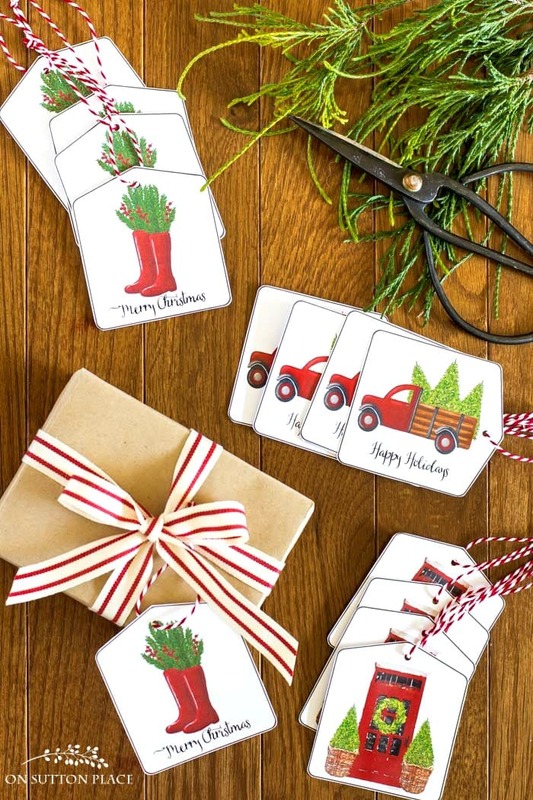 Ann is gifted at creating printables! I’ll be using some of her’s on my gifts this year!